It’s a new year at Vivians and the Lower Sixth come back to find an adventure awaiting them: they are to be sent on an exchange trip to Madrid to learn the language, while their Spanish counterparts will be received at Vivians. In the weeks that follow the girls, including Tammy Dunbar, have an experience they will never forget. They learn to work in an unfamiliar language and be part of a school whose rules and customs are very different from their own. In their free time they enjoy an independent life in a Spanish pensión, filling their days with the excursions and new friendships that are an important part of their visit. Meanwhile, the pupils left behind – not always happily – at Vivians help the Spanish exchange students fit into English school life. There is a welcome glimpse of some much-loved old girls as they come to give talks for a career day, and new pupil Dawn struggles to find her place in the school. 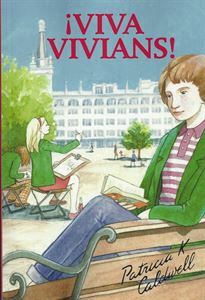 First privately printed, this edition of ¡Viva Vivians! has extensive new material, and Pat has also written a fascinating introduction describing her own experiences as a language student and teacher in 1960s Madrid.